It is no surprise to me, and completely in keeping with my personality, that by the time I’ve actually arrived at the post where I’m supposed to reflect about having this blog for one year, I am wholly sick of reminiscing. I feel like I’ve spent the last three months doing a little too much navel-gazing and not enough actual work so without further ado… let’s talk cake. I’ve become a bit obsessed with the idea of “Master” recipes. I am endlessly unsure about the future but one thing I do know for sure, à la Oprah, is that someday I will have curated an edit of essential, no-fail, basic recipes that can either stand alone or serve as a rock solid jumping off point. It’s literally all I want. The Best Chocolate Cake. Foolproof Pastry Cream. Go-to Royal Icing. Ultimate Vanilla Swiss Meringue. I want them organized and I want them now. I have made some progress. Last November I taste tested pumpkin pies until my hands turned metaphorically orange but, ultimately, the experiment proved worthy because I now have one favorite recipe that I know is my favorite. No more guessing. So when it came time for me to make myself a birthday cake for the blog, I thought I’d continue in this quest and find the perfect yellow cake recipe. What’s simpler than yellow cake? It turns out almost everything is simpler than yellow cake. Yellow cake doesn’t feature any particularly intense flavor other than a little vanilla. It doesn’t hide behind cocoa powder or spices or fruit so it just kind of is what it is, cake in it’s most essential form: flour, fat, sugar, eggs, milk. I use a toothpick to create straight lines as a guide for the writing. I spent more time than I care to admit researching “retro writing” and worrying about getting this right. All of the recipes I tested (four finalists) had a strikingly similar ingredient list with only minor distinctions. All used flour, baking powder, salt, butter, sugar, eggs, vanilla, and buttermilk. However some used Cake flour instead of All-Purpose; some used baking soda in addition to baking powder; the sugar percentage varied by as much 100%; some used whole eggs, others used a combination of whole and yolk, or yolk and white separated. So yeah, not complicated at all. In the end, I found that I preferred the cakes made with All-Purpose Flour rather than Cake, and that I preferred less sugar over the cloyingly sweet versions. I didn’t like the cake that was Chiffon-style with the egg whites whipped back in because it was too airy and I like a yellow cake with a little firmness too it (firm, but not dry). Even though all the cakes used butter (which is imperative for flavor), I took a hint from a Bon Appetit version and added a little oil too which I think noticeably improved the moistness. I also used clear imitation vanilla extract rather than the real stuff which is a nod to Christina Tosi’s famous Milk Bar Birthday Cake. Yellow Cake on file. 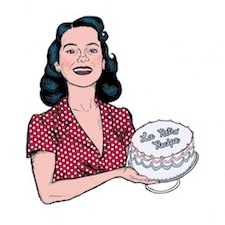 One Year for La Retro Recipe. Now…. I celebrate with a nap. Happy Birthday to me. Preheat oven to 350°. Grease and flour 2- 8 inch round cake pans and line with parchment paper. In a medium bowl, combine flour, baking powder, baking soda, and salt and whisk together to remove any lumps. In the bowl of an electric mixer fitted with the paddle attachment beat together oil, butter, and sugar for 2-3 minutes until the mixture is very light and fluffy. Add eggs, one at a time, scraping the bowl down after each addition. Beat on medium speed for another 2 minutes. In a liquid measuring cup, measure out the buttermilk and add the vanilla. With the mixer on low speed, alternate adding the dry ingredients and the buttermilk/vanilla, beginning and ending with the dry ingredients and scraping the bowl down frequently between additions. Divide batter evenly between the two pans and bake for about 35 minutes, or until a cake tester comes out clean. Chop chocolate and place in a heatproof bowl over a pan of simmering water. Stir frequently until chocolate is melted. Set aside to cool. In another heatproof bowl, combine sugar and egg whites and place over the same pan of simmering water. Heat until you can pinch the mixture between your fingers and feel no graininess from the sugar. Transfer mixture to the bowl of an electric mixer fitted with the whisk attachment and beat on high, until the meringue reaches stiff peaks. (This takes some time). Switch to a paddle attachment and add salt and butter, one tablespoon at a time, beating vigorously. Lower mixer speed and drizzle in the cooled chocolate and vanilla. Continue mixing and scraping the bowl until the mixture is fully combined.